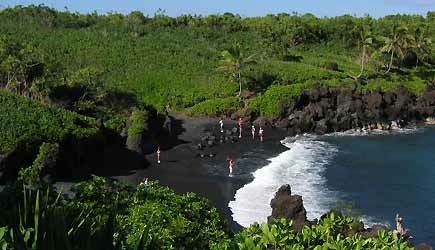 Maui Day Trips from Oahu includes a full-day tour of the Hana Rainforest, waterfalls, black sand beaches, and Hana town. This is a great way to get out and enjoy the REAL Hawaii. 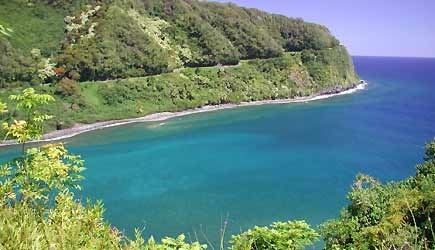 Tour includes: Round-trip transportation to/from Waikiki hotels, round-trip airfare to Maui, and guided tour to Hana-Maui. Lunch and beverage. What to Bring & Wear: Please bring your photo IDs for flights. Wear comfortable walking shoes and dress appropriately. Note: Road to Hana is narrow and winding. The ride to Hana may be rough as there are stretches of uneven surfaces. For the ultimate in personal freedom and flexibility in your day, perhaps a fly-drive package is right for you. This includes round-trip airfare to Maui and a rental car for the day. Once you get there, you are free to drive around and explore the island on your own. This package does not include transportation between Waikiki and the airport. The driver of the rental car must be 25 years of age or older with a major credit card in his/her name. Time: Typical itinerary is around 6:30am departure and around 8:30pm return on the same day. If you have other flight requests, please contact us at 1.877.678.7333. Note: All fly-drive packages are priced based upon double occupancy … the per person cost will be $20 higher for those traveling alone. Rate is $50 higher from 12/15 to 1/4 due to holiday rates on rental cars. Rate can also be higher if ordered last-minute.